Take charge of a top film studio and prove your money making skills by producing box-office hits! In Hollywood players take on the role of different film studios recruiting talent with the goal of making award winning films over the course of three years (each year being about 10-15 minutes of play time). Recruiting talent happens in a variety of ways. Players start with one star talent card and will then each get seven basic talent cards that they will pass around as they draft one card at a time with the goal of creating combinations for completing movies. Then there is a final round of bidding where players will get one more star talent card. After that it’s time to put your movie combinations together and see how much money you’ll make, and who’s movie will get the Film of the Year Award. Make the most money over the course of three years and you’ll be the winning studio! Hollywood does an excellent job of scaling itself based on the number of players. Whether you’re playing with two players or all the way up to six, set up is just as easy, the game plays the same and the game time doesn’t fluctuate much (7 Wonders by Asmodee comes to mind as a comparison). Players will choose which film studio they want to be. While each studio is based on a color, they are also parodies of actual film studios as you can see in the image below. The art and style of the game definitely welcomes you in with a fun and light hearted tone. Players will then take their film studio’s bidding cards and auction tokens. The tallying board is set out where players will track their millions of dollars earned or lost during bidding and film production. In a row at the bottom of that board will be a set number of star cards and the star deck that players will be bidding for. The worthless script cards are set next to the board, the basic card deck is shuffled and 7 cards are dealt to each player. You’re now ready to start making films! A game of Hollywood consists of three rounds called production years. During each year players will gain, draft and bid for cards that will be used to create their film or films at the end of each production year. Secret Star Card Distribution – One player draws a number of star cards matching the number of players, then after looking at them gives one to each player. This can be a huge advantage and because of that players will actually bid to be able to be the one in charge of distribution. Or… if you’ve won that year’s Film of the Year award, you’ll be the one who gets to distribute the cards. Drafting – Each player will be dealt 7 basic cards that will include scripts, directors, actors and film crew. Players will take one card, then pass the deck to the player on their left. This continues until everyone has 7 cards. That first star card you got at the beginning of the round can be a big deciding factor in what cards you choose to draft. Auction – Now the bidding begins. Players can choose to bid for a specific star card or the option of taking the top card off of the face-down star card deck. Players will secretly choose how much they want to bid, and what card they want to bid for. Winners get the card, and then the losers continue bidding until all player have gained one star card. Making Money & Winning the Film of the Year Award! – Now players will tally up how much money their movies made, moving their marker up the appropriate number on the tallying board. Whoever has the movie with the most Award symbols on the cards will win the Film of the Year Award. Now the production year has ended, the round phases repeat for two more production years and then the winner is determined. Note that at the end of the third year, if you have one or more Film of the Year awards, you will multiply the number of awards by the number of cards you have gained over the three production years that have award symbols on them! This means you won’t want to let one player get away with getting all the Film of the Year awards or they’re most likely going to be the winner. Hollywood is all about ending up with a set of cards that will make you the most money when you make your films, so now it’s time to look at the cards. There are four types of genres in this game, represented by icons at the bottom of some cards: romance, comedy, action and thriller. When you see a card with one or more of these symbols on it, it means that card specializes in that genre. The key to making lots of money is to have as many cards in your movie as possible that match the genre of your script card. For example, if you have an action movie script, with a director and actors that specialize in action movies, it’s gonna bring in big money! Some of the cards also show award symbols in the upper left. Each production year, the movie with the most award symbols will receive the “film of the year” award, which gives that player some special advantages during the next round, as well as earning them more money at the end of the game. This represents the fact that award winning films make money long after they’ve left the theaters. You’ll need one of these for each film you make. Your other cards in the film don’t have to match the genre of the script, but if they do you’ll earn extra cash. If you don’t end up with a script and/or need an extra one when it’s time to produce your films(s), you can always discard a card and grab a worthless script, just note that you don’t make as much money with a worthless script… hence the name. You’ll need one of these as well for each film you make. Unlike the option to grab a worthless script during film production, if you don’t have a director you won’t be able to complete your film. If you want to create multiple films, you’ll need a separate director for each one. To complete a film you’ll need to have at least one actor or actress. You can have up to two actors in a film, and if you’re able to have a male and female lead, then your movie is going to make even more money. These cards are an added bonus to any movie, and you can play as many of them as you want on a film. They include crew like makeup artists, special effects supervisors, editors, set designers, etc. They will typically have special symbols on them that allow you to complete films and/or give bonus money for the film they’re a part of. The art and design of Hollywood makes it fun and easy to play. The character illustrations are great, and careful thought has been put into the color coding and icons on all the cards and components. The quality of the cards, tokens and board is also top notch. The basic mechanics are very easy to learn, though it will take some time for players to understand the various ways you can earn more money based on the combinations of cards you use to complete a movie. If your family enjoys movies, this is a great game to have. The basic mechanics are simple, yet there is plenty of strategy. There can be a lot to consider when you’re choosing which cards to draft, so younger children will probably need assistance. This isn’t a “party game,” but because of its theme, and the fact that you can play with up to six players, this is definitely a game you could pull out in a social setting. Another added bonus is that because turns happen simultaneously, no one is left waiting and the game goes just as fast whether you have 2 or 6 players. For a strategy purist, Hollywood probably wouldn’t be as enjoyable since there can be a lot of luck involved with the cards. Casual gamers will enjoy how easy it is to learn Hollywood. It also has a fun combination of mechanics. Hollywood has a lot of replayability. It’s easy to teach, quick to play, and has a theme and mechanics that almost any group you play with will enjoy. Hollywood is probably a bit light for a power gamer. They might enjoy it as a filler, but they won’t be dreaming about it at night. Hollywood gets it right with mechanics and theme that support each other in a very intuitive way. We found it common when playing to think “of course, because that’s how it probably is in real life!” For example, just like in real life where you have a select amount of talent that different production studios are always trying to get in their movies, in Hollywood you each draft from a shared “pool” of basic talent and then bid for the star talent. This excellent harmony of mechanics and theme makes the game even more fun and easy to learn, teach and play. Another fun thematic element is that when multiple player’s movies have the same amount of award icons, the other players get to vote for which movie they feel should get the Film of the Year award. And it’s really fun to look at the cards used in the movies and imagine what type of movie it would be and which one you think you’d like better. It doesn’t happen too often, but it’s a nice additional touch of gameplay. There are a lot of ways to combine the cards to maximize your movie making potential, and trying to explain all of those variations right off the bat to new players can cause a bit of rule overload. The simple solution is to teach the basic rules, and then do a “warm-up” round where you can answer questions. The round should only take 10-20 minutes and new players will quickly learn what works and what doesn’t, and be ready to dig in and start producing blockbuster movies! 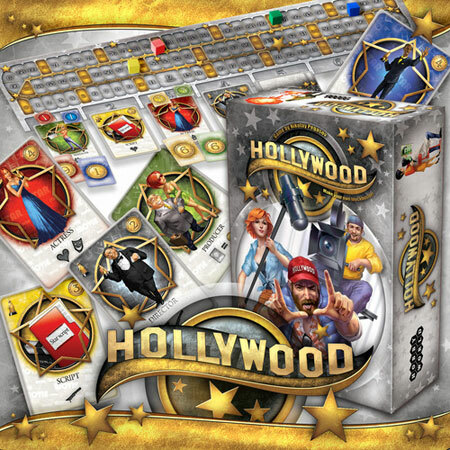 Hollywood is a great game to have in your collection if you’re looking for something that is quick to play and has a theme that almost anyone will relate to and enjoy. Lights, camera, action! Each day the Dream Factory produces hundreds of movies, but only about a dozen of them actually perform well at the box office, and only a select few of the become true classics. Hollywood is ruled by money, but money alone does not decide everything. The trick for getting a successful movie venture off the ground is to strategically choose your film crew. If you manage to bring the right people together, you will manage to shoot a blockbuster and beat the competition. Each player is the boss of a famous Hollywood studio, trying to produce the most successful blockbuster of the year in one of the four main genres: action, thriller, romance or comedy. The movies are constructed from game cards which are drafted by players at the beginning of the production year. Each movie must contain a script, a director and at least one actor or actress. Additional cast members are optional, but they add to the movie's total box office. Players compete to get the most popular stars to perform in their movies, because this gives you more money and more Hollywood Awards! The game is over after three production years and the richest studio boss becomes the winner. Add a Review for "Hollywood"